When rain falls on the ground, some of it travels slowly down through the ground to the aquifer. As water makes its slow journey, it is filtered by soil, sand and gravel. This water is called groundwater. Think about your local creek, river, or stream. Where does it come from? What type of landscapes does it pass through? All of the area covered is a watershed. What happens on the land affects the water in the ground as well as the local creeks, river, streams, and the fish that live in them. An aquifer is the area underground where spaces between gravel, sand, clay, or rock fill with water. 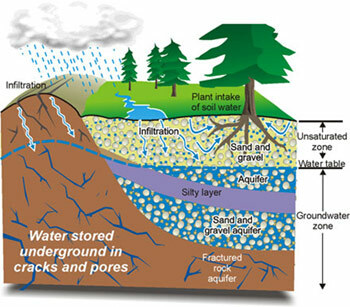 Water stored underground is called groundwater. There are different types of aquifers. When water is found in cracks and pores in the rock, we call this a 'bedrock' aquifer. When water is found in the spaces between sand and gravel, we call this a 'sand and gravel', or 'unconsolidated' aquifer. The RDN has both types of aquifers. See RDN Water Regions, click on an area and then select "Aquifers" for more information. 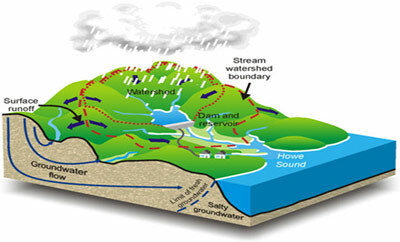 Groundwater and surface water are connected. Have you ever wondered how rivers continue to flow even if there has been no rain for weeks? One answer is ground water. It continues to supply water through the banks and beds of rivers and streams. Once in the river, ground water becomes surface water! And sometimes surface water goes back into the ground.